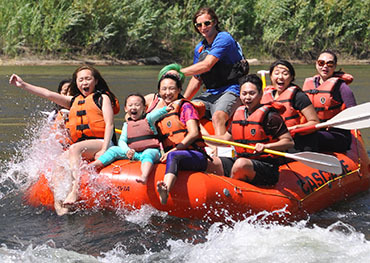 This three-hour getaway has playful rapids, perfect for everyone-especially families, first timers, groups, and tours. 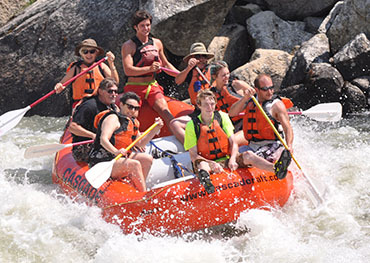 Young and old, beginners and veterans alike enjoy splashing, sunning, and whitewater fun on this friendly Class II-III river trip. Spectacular scenery with glimpses of Idaho’s abundant wildlife highlight this full-day trip as you glide through eleven miles of dense, remote forest. Relax in the warm water, enjoy your delicious riverside lunch on this Class II-III section, and let the river wash the world away. A hometown favorite! This three-hour getaway has playful rapids, splashy whitewater and time for swimming, relaxing and floating. 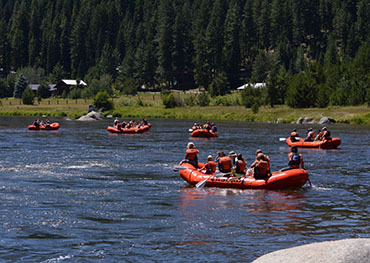 After checking in at the Cascade Raft River Center, we will take a quick drive upstream to put-in location at Banks, Idaho, the confluence of the North and South Forks of the Payette. Your guide staff will equip everyone with lifejackets, paddles, and safety information before you start the 8-mile trip back to our river center. Rapids you will encounter include GLOYF (Go Left or you're Fired), Bennett's Rock, Mike's Hole, Chief Parish, Mixmaster, and AMF (Adios My Friend). Expect to get wet! These rapids are rated class III--big, playful waves, but little maneuvering required. 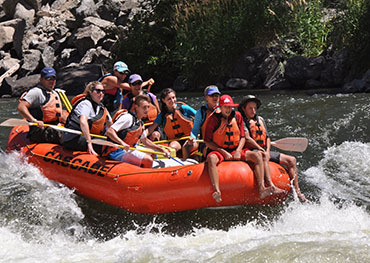 A perfect trip for first-time rafters, families, groups, locals and visitors, the "mighty Main" will take you from Banks to the Cascade Raft River Center, from the bustling city to tranquil outdoors, from the everyday to a lifetime memory. Idaho’s scenic gem! 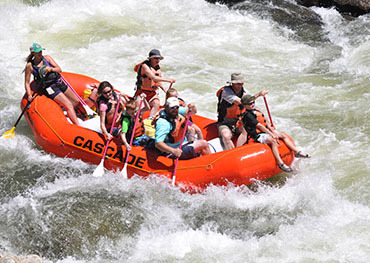 Enjoy a full day of family-friendly whitewater rapids, spectacular scenery, and abundant wildlife as you follow warm clear water through the tall pines. Meet at the Cascade Raft River Center and we’ll take care of the logistics from there. Your guide staff will equip everyone with lifejackets, paddles, and safety information before you start the 11-mile trip to Smith's Ferry. Among the times of swimming and relaxation, you will encounter friendly class III rapids such as Trestle, Francois, and Howard's Plunge. Sightings of osprey, bald eagle and other wildlife are common and add to the outdoor experience. After lunch we continue downstream, under the scenic Rainbow Bridge, and through the last big splashes of the day. These are the days that memories are made of, so grab some friends and join us! Recommend 100%. The guides are usually helpful and talkative. They care about your rafting experience and you get to share some of your life with them and they share some of their stories with you. They're always willing to answer questions. I can't speak for pricing but it's always a good experience for me. "I've been on 3 trips this summer with Cascade. All the guides are great- super fun but definitely know their stuff and you feel like you are in good hands. The price is ridiculously reasonable and the South Fork is so much fun." 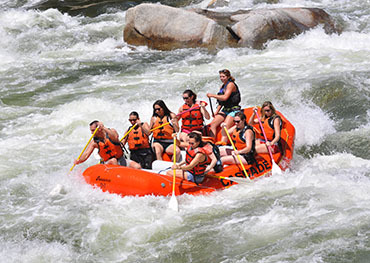 "Just returned from our 5th rafting trip with Cascade, great time had by all involved! We had so much fun, we will go once more this summer. Great staff, clean equipment and friendly smiles. What more could you want?"